A modernised version of the older Universal Racer Mk 1, the UVR 2, made it's printed debut in a WW2 era D Lewis Ltd catalogue. 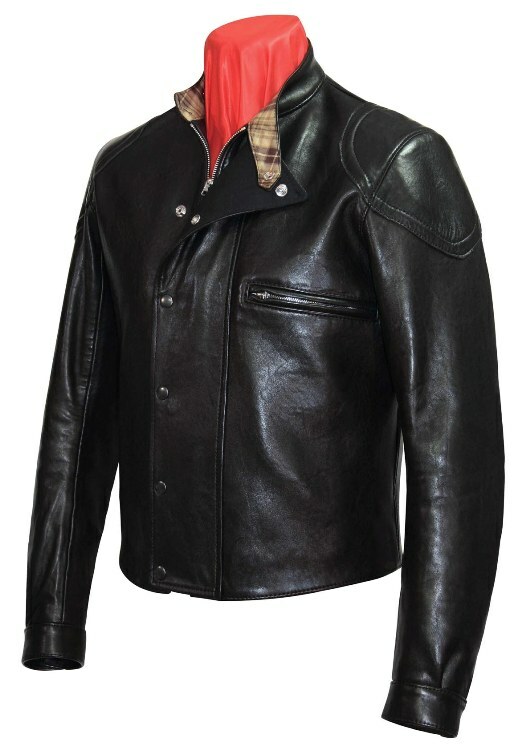 The jacket entered the D Lewis production line during the late 30's and remained in the range until the mid 1960s. Now, many years later, coupled with their usual painstaking love and attention for producing every last detail correctly, Lewis Leathers have released a brand new version of this much loved jacket. Steve McQueen, would visit D. Lewis on several trips around the end of the filming of The Great Escape and was photographed wearing the jacket by Lynn Wineland in 1963 at the Greenhorn Enduro (a 500 mile race across the Mohave Desert) and also by John Dominis whose photos were later published in LIFE Magazine. The following year Steve McQueen was back at D Lewis with his ISDT team-mates, where they bought gear for the forthcoming Silver Vase Trophy race, their visit is described by McQueen's close friend Bud Ekins in Rin Tanaka and Sean Kelly's '40 Summers Ago' book from Cycleman Books. Lewis Leathers are proud to be able to produce this fantastic jacket once again, which was worn by such an iconic star, as Steve McQueen.